To include a transformer in your workspace, locate it in the Transformer Gallery and double-click. This will place it on the canvas. You can also drag and drop it onto the canvas, or (if you know the transformer name), use Quick Add. Note: Transformer icons that include a green arrow are available at no cost from FME Hub. Click to download the transformer and include it in your workspace. When the output from the source type or a transformer is connected to another transformer, Workbench makes an implicit connection between all attributes that have the same name. If necessary, Workbench automatically assigns attributes to transformers based on both the transformer itself (usually one specific attribute like count or length, for example) and then appends the attributes contained in the input connection. Connect transformers using Quick Connect. Connect transformers using Drag and Insert. You can manually connect transformers to a feature type, attribute, or another transformer by dragging the yellow arrow to the desired place. When the connection is placed, both arrows will turn green. You can also connect a transformer by dragging it close to a connection port until you see a highlight, using the green triangle as a guide. The connection is set when you release the mouse button. Note: If there is more than one port to connect, a dialog prompts you to set the connection. You can then manually connect output ports to their destinations. Do you have many connections that you'd like to route around other transformers and feature types? Select the connection, click the right mouse button, and then select Insert Vertex on Connection. (Or, you can double-click the connection.) You can drag the vertices anywhere on the link, and use them to route objects around parts of your workspace. To remove vertices, select the connection, click the right mouse button, and then select Remove Extra Vertices. To copy an existing transformer, select it and press Ctrl + D (or right-click and select Duplicate from the command menu). A copy of the selected transformer will be placed on the workspace. This is a useful feature if, for example, you have already defined parameters that you want to duplicate. Note: The properties button will change back to yellow on the duplicated transformer to remind you that you to either accept or edit the transformer parameters. Select a transformer and press the Delete key. 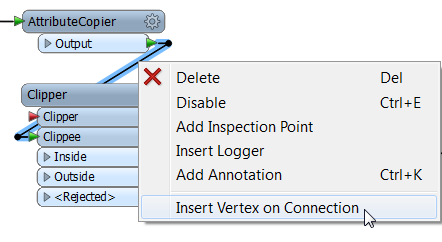 FME will try to repair any connections from the deleted transformer (see Smart Delete). If you have a lot of unattached transformers to remove, select Tools > Remove > Unattached and check the box beside each transformer.